According to this post, I’m supposed to have a small grid showing my hand results. And I paid for this privilege. I just played tzars for 234 points on a random board. It probably won’t show up in my results. You need to fix this. I’m not getting my money’s worth. I could have continued with the version with the advertisements and maybe get better results. When will statistics for Windows be available? Hi all, what about a new release for Windows Phone (8/10)? And why can I not find the statistics on my Android? Have you got the paid or free version. Statistics are only available on the paid version. On Android I use the Commercial Version. My skill ratings are not visible on my IPad. They where visible for a while but now I can not see the grafics nor the rating. I payed a long time ago for not having publicity. I have purchased the full game but my stats are not updating. Please, update the Windows Phone version. Or if you need help, I’m available. Hi it’s me, I am also visiting this site daily, this website is actually pleasant and the people are in fact sharing good thoughts. Please note, that not all newer statistics show up in my results. Doesn’t it work anymore? I can also not see my statistics graph, even after paying for not having the ads. A random opponent resigned after my opening play of six points. WF then included that as a 6-point game for me, dragging my average score way down. That’s unacceptable, and makes your statistics for avg score worthless. Are you looking at the standard board or are you looking at overall stats? There is no skill rating on the random boards. I imagine this is what you need to look at. Hope this helps. After downloading Wfeud in dutch it appears and only plays in English . Can anybody inform me how to change the langue? I am playong dutch WF, and my skill rating had just risen over 2000. Now, after winning another game, it suddenly dropped to just over 1900. Why? Can I get an answer on my question from the develloper? Once again, a random opponent resigns after my first move, and Wordfeud mindlessly includes my 58-point game into my average score. This is bogus. There are a few ways Wordfeud statistics could handle resigned games that would make sense. At the very least, discount them from being included in the average score statistic. Or, scale them up by a factor that takes into account the number of unused tiles and the players average points per tile. The stupid approach that you currently use is going to prompt me to discontinue your game, if not fixed soon. I would like to reset my skill rating, is this possible? I lost my mobilens Well , and Im using the same account. You should be able to retrieve your account if you use the same e-mail adress as the last one. 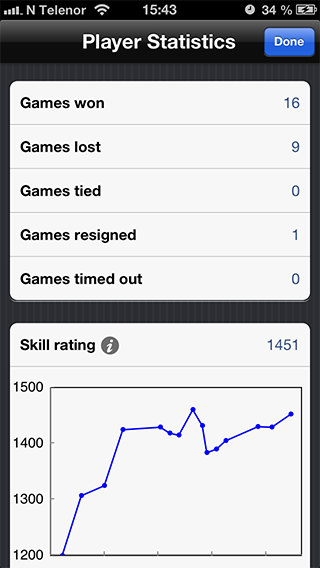 my skill rating shows a long horizontal line inspite of winning and losing. What has gone wrong? Why do I get words with bubbles above the letters or correct words noted as incorrect? I just upgraded for my phone because I like knowing the rankings of the players I play but what shows here is game count. On my tablet I can get full stats on each player. How come rankings are not available on my phone…..the only reason I upgraded the phone! My statistics are extremely inaccurate! i’m having an issue with getting too many sets of doubles of the same letter. for example; almost on every turn, i have 2 II and 2 NNs. this started about a week ago and i’ve been playing this game for a few years now. anyone else experience this? This is not only from as you noticed it of the last week. Every now and then it is so annoying. Already last year I sent several messages with the complaint. Sometimes even 4 D, 2 Z and indeed last week it started again. Not only in my games but also in the games of my friends. We have a rule now that if there are too many doubles, we change them all and the next move the other passes thear turn. It is the only way. Why cant I see my own skill rating? Can only see my players skill rating! My own rating comes up when I play the last letter and it shows my rating chansen! Rating changes! Should i be! All these complaints do not seem to accomplish any improvement. i think they dont even read them , i stil dont have an answer to my question why i get the advertisement version again after paying for the pro version. so…. I bought the pro version last year for my phone. When i got a new phone i had to install wordfeud again. I logged in with my username and password, but to my surprise the paid for wordfeud with statisticus etc was not wath i saw..
Pls add all features from ios and android to Windows Mobile 10 as well. We payed the same mony value. When can we expect the skillrating back on iPhone6 in the paid fullversion? It only shows on iPad! why is that??? i want my payed version back…. i did pay the 4 euro’s…. not that its much, but its a principle, when it happens often also with other people, then thats a nice income for feud…. Which is the highest word score that you are aware of? This is great and has made me really competetive! However, my New Rating shown on the You won/You lost Screen, is always different to and higher than my rating shown in the graph. Why is this? I just played the word AA and scored 578436 points. I just earned 1,660 points for playing one English word: chorreas. I mean choreas, sorry. In the graph representing a players rating, the curve does not move beyond the 1800 score. For instance, with a score of 1850, the vertical axis on the left does not correspond. My graph has disappeared….I want it back! my stats have not been updated for more than a year now. I have looked for an update icon but there is none. What do I have to do to get my stats updated? Hello. How can i reset my wordfeud statistics? Mine are not showing correct updates after buying premium years ago. System defaulted back several years to when I first bought the premium. Players say they see something different than what I do when viewing stats.